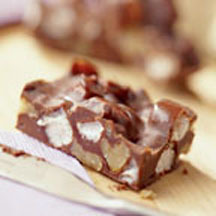 Rich and truly delicious fudge the easy way using the microwave method. Each piece is a smooth mixture of chocolate chips, sweetened condensed milk, marshmallows and walnuts. Line 13x9x2-inch baking pan with foil; grease lightly. Microwave morsels and sweetened condensed milk in large, microwave-safe bowl on HIGH (100%) power for 1 minute; stir. Microwave at additional 10 to 20-second intervals, stirring until smooth. Stir in vanilla extract. Fold in marshmallows and nuts. Press mixture into prepared baking pan. Refrigerate until ready to serve. Lift from pan; remove foil. Cut into pieces. Nutrtional Information Per Serving (1/48 of recipe): Calories: 100 Calories from Fat: 46 Total Fat: 5.1 g Saturated Fat: 1.6 g Cholesterol: 0 mg Sodium: 13 mg Carbohydrates: 12.9 g Dietary Fiber: 0 g Sugars: 10.5 g Protein: 1.3 g.